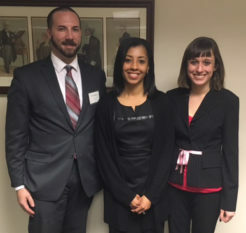 Second-year NIU College of Law students Cody Chinery and Heather Fielder advanced to the semifinals in the 2016-2017 American Bar Association Regional Client Counseling Competition. The competition took place at DePaul University College of Law on Saturday, February 11, 2017, and the topic of this year’s competition was Privacy Law. Northern Law’s team was coached by Professor Yolanda M. King, who attended the competition.